Scientists are proposing a radical new way of think about how the universe began. In a new imagining of the Big Bang theory, they think it could have been the result of a four-dimensional star collapsing in on itself to form a black hole, which then proceeded to spew its guts out and, kindly, form our universe. The standard Big Bang theory has some limitations. The singularity—the idea that everything came from essentially nowhere—is one of them. The fact that the universe is at an almost uniform temperature is another, because that doesn't square with the speed at which the universe has expanded. So physicists often ponder alternative theories that could explain the origin of our universe. Our three-dimensional universe floats as a membrane in a "bulk universe" that has four dimensions. That "bulk universe" has 4D stars, which go through the same life cycles as our normal 3D ones. The most massive ones explode as supernovae, and their central core collapses into a black hole, like in our universe—just in 4D. The 4D black hole has its own 4D "event horizon," a boundary between the inside and the outside of a black hole. The 4D black hole, then, blows apart, with the leftover material forming a 3D membrane, surrounding a 3D event horizon, which expands—and is essentially our universe. 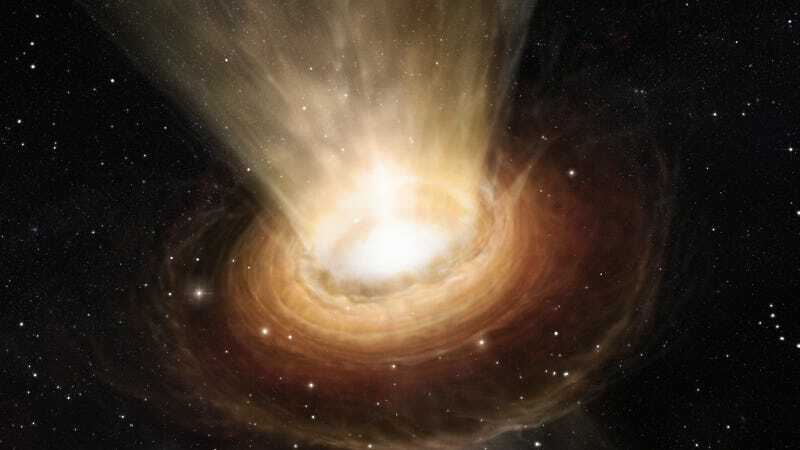 So, according to the theory, our universe is the vomited-up guts of a 4D black hole. The expansion of the event horizon explains our universe's expansion; the fact that its creation stems from another 4D universe explains the weird temperature uniformity. You can take a second to process all that, it's okay.